Faster DDR5 system memory is now in the pipeline, with the new standard expected to be officially introduced next year, to be followed by memory sticks which will offer a major boost in terms of performance compared to current DDR4 RAM. Announced by JEDEC (Joint Electron Device Engineering Council), swift progress is apparently being made on both DDR5 and the accompanying NVDIMM-P design standard. JEDEC says that compared to existing DDR4 system memory, DDR5 will deliver “double the bandwidth and density”, so in layman’s terms, it’ll be twice as quick, and it’ll also offer better power efficiency compared to DDR4. As mentioned, NVDIMM-P is the accompanying hybrid memory spec being worked on alongside DDR5, combining DRAM with Flash storage to produce a “new high capacity persistent memory module”, as JEDEC describes it. The key word there being persistent, meaning data can be stored between reboots (or if the machine crashes). NVDIMM-P is expected to be backwards compatible with DDR4 memory, incidentally. 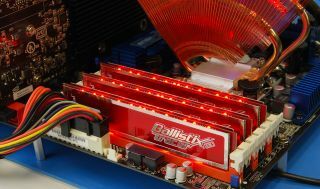 We can expect to see actual DDR5 memory hit the market probably a year after the standard has been finalized, meaning 2019. As ever, though, the initial products will be targeted at heavyweight usage in servers, and as ExtremeTech notes, memory sticks aimed at consumers will be considerably further out – possibly a few years down the line. Still, it’s always interesting to see what’s in the pipeline in terms of new tech, and to know that there’s forward movement being made in terms of system memory as well as next-gen processors, graphics cards and other components. Of course, Intel’s Optane Memory is another one to keep a close eye on, and that’s here right now, having just been launched as small sticks of cache which give a traditional hard disk an SSD-like turn of speed (albeit via the M.2 slot, not DIMM sockets, although Optane DIMMs will be coming before long).